This Scooter Is Very Fast and Lots Of Fun To Ride. ACT NOW AND GET A FREE SEAT KIT! Introducing the NEW STANDARD in Electric Powered Personal Transportation. Fast, quiet, totally efficient, and can travel 12-15 miles at speeds up to 30 miles per hour on a single charge. Featuring the most powerful 1600 watt super efficient brushless motor, 4 rechargeable battery pack equaling 48 output volts, and you get all of this with a 100 dollar seat kit tossed in for free. 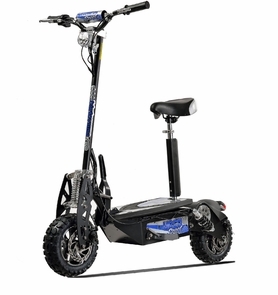 Large 11" tires, premium wheels, chain drive, and front/rear disc brakes stop this scooter with ease and is the perfect solution for short trips, campus commuters, work, recreational enthusiasts, boaters, tourists and much more. Yes, the seat is removable. Need more cruising range? Just press the economy mode button to extend the distance you are able to travel. Trend Times.com is not responsible for the use of the electric scooters we sell. Please use them safely as we will not be liable for any injuries that may occur as a result of the use of these products. Children should have adult supervision while riding motorized items. Motorized gas scooters are not toys and require care and maintenance. All warranty and service work is done through the manufacturer. Free shipping is not available on scooters as they are oversize items that arrive almost fully assembled for your convenience. Your order will be upgraded to Fedex ground instead of freight trucking at no additional charge as our gift to you if you order today.